The 1-3 Ton ice machine maintains ambient temperature of 5℃ to -50℃. The Ice Flaking Machine produces 1-3 ton of ice per day. The CE approved ice Flake machine are made in strict accordance with the ISO standards and are microprocessor based with advanced technologies and quality instruments. Weiber High Capacity Ice Flake Machine is a stand-alone appliance for making ice on a large scale as per the customer’s requirement. These Commercial Ice Flake Machines are made of corrosion free metal components with advance polyurethane insulation ensuring maximum thermal efficiency and durability. This machine offers important application in Fishing industry, food processing, concrete mixing plants, chemical plants, mine cooling, skiing ground, medicine, and so on. 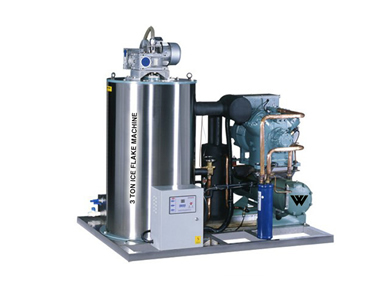 Weiber ICE FLAKER MACHINES is double walled cooled units.Outer body of are constructed out thick PCRC, pre coated corrosion resistant GI sheet duly pre-treated with primers and rust proofing and painted with long lasting stove enamel or elegantly powder coated.The inner construction is made of stainless steel sheet-304. The 100 mm gap between the walls is filled high grade polyurethane insulation, which ensures maximum thermal efficiency. An energy efficient cooling unit is installed in our machine. We use high end CFC free compressors of Kirloskar/Tecumseh / Bitzer/ Danfoss make, conforming to latest international standards and guidelines. Dia.of water inlet pipe 5/8"